Hernando Ombao is Professor in the Department of Statistics at the University of California, Irvine and Fellow of the American Statistical Association. Martin Lindquist is Professor in the Department of Biostatistics at Johns Hopkins University and Fellow of the American Statistical Association. Wesley Thompson is Associate Professor in the Department of Psychiatry at the University of California, San Diego and Lead Scientist at the Institute of Biological Psychiatry, Mental Health Services, Copenhagen, Denmark. John Aston is Professor in the Statistical Laboratory at the University of Cambridge and Fellow of the American Statistical Association. 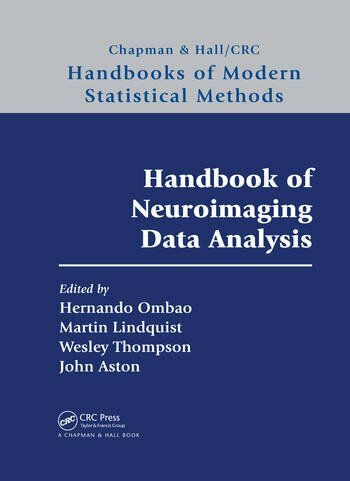 "Handbook of Neuroimaging Data Analysis is a great source to help you get started . . . If you find a particular modality that interests you, just email one of the authors in the book who also works on data analysis within that modality. They are all friendly and helpful, and they will point you to sources of publically available data." "These chapters are primarily written by statisticians, but the book is nicely balanced by contributions from biomedical engineers, psychologists, and cognitive scientists. . . I recommend this book to statisticians interested in learning about neuroimaging and contributing to its growth."